Looking for more fabulous war movies like Dunkirk? Check out 11 of our favorite flicks that give you all the intense feels you’re craving! 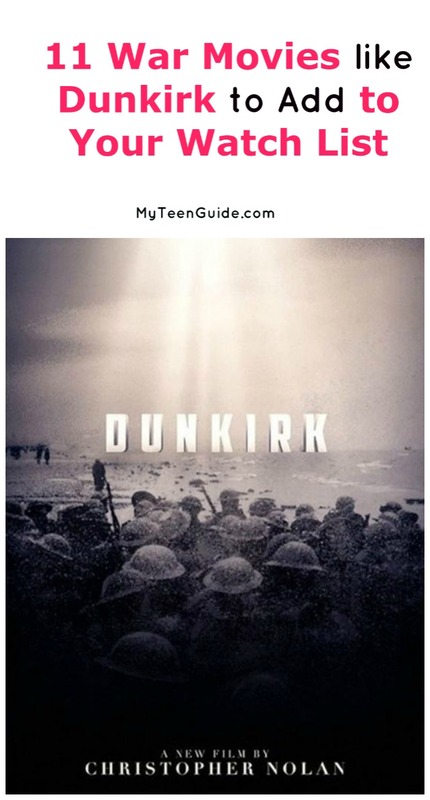 As we told you earlier this week in our trivia and quotes post, Dunkirk is an upcoming war movie, based on the 1940 Dunkirk evacuation and is due to be released in theaters on July 21, 2017. I think this is going to be a must-see movie for both history buffs and fans of war movies. Here are some movies for you to check out like Dunkirk. Saving Private Ryan is pretty much the epitome of must-see war movies! The 1998 epic drama is set during the Invasion of Normandy in World War II and follows the efforts of the military to save a mom’s last surviving son. Her other sons were killed in action. Be warned that it’s an incredibly graphic movie, but it’s also one of the most accurate accounts of WWII. Enemy at the Gates is a 2001 war movie that is based on the 1973 book- Enemy at the Gates: The Battle for Stalingrad- by William Craig, which details the 1942-1943 Battle of Stalingrad. Enemy at the Gates stars Jude Law, Joseph Fiennes, Rachel Weisz, Ed Harris and Ron Perlman. Pearl Harbor is a 2001 romantic, period, war movie that is loosely based on the 1941 Japanese attack on Pearl Harbor, Hawaii. Pearl Harbor stars Ben Affleck, Josh Hartnett and Kate Beckinsale. Hart’s War is a 2002 thriller drama movie that is based on the 1999 book of the same name by John Katezenbach, which details a WWII prisoner of war camp. Hart’s War stars Bruce Willis, Colin Farrell, Terrence Howard and Cole Hauser. Windtalkers is a 2002 war movie, set during WWII, and tells the story of Marine soldiers who were tasked with protecting Marine Navajo Code Talkers. Windtalkers stars Nicolas Cage, Adam Beach, Peter Stormare, Mark Ruffalo and Christian Slater. Defiance is a 2008 war movie that is based on the 1993 book- Defiance: The Bielski Partisans- by Nechama Tec. The movie details a Jewish partisan organization that saved Jews in the European country of Belarus, during WWII. Defiance stars Daniel Craig, Liev Schreiber, Jamie Bell and George MacKay. Valkyrie is a 2008 historical thriller movie that showcases the July 20, 1944 plot to assassinate Adolf Hitler, by officers of the German Army. Valkyrie stars Tom Cruise, Kenneth Branagh, Bill Nighy, Eddie Izzard, Tom Wilkinson and Terrence Stamp. Fury is a 2014 war movie that details the end of WWII, with U.S. crew tanks as they battle their way through Germany. Fury stars Brad Pitt, Shia LaBeouf, Logan Lerman, Michael Pena and Jon Bernthal. The Imitation Game is a 2014 historical, drama, thriller movie that is loosely based on the 1983 biography- Alan Turing: The Enigma- by Andrew Hodges. The Imitation Game stars Benedict Cumberbatch, Keira Knightley, Matthew Goode and Rory Kinnear. The Monuments Men is a 2014 war movie that is loosely based on the 2007 book- The Monuments Men: Allied Heroes, Nazi Thieves and the Greatest Treasure Hunt in History- by Robert M. Edsel. The Monuments Men stars Matt Damon, George Clooney, Bill Murray and John Goodman. Hacksaw Ridge is a 2016 biological war drama movie that is based on Desmond Doss, a U.S. Army combat medic, who received the Medal of Honor for saving the lives of his fellow soldiers during the 1945 Battle of Okinawa, without using firearms or weapons. Hacksaw Ridge stars Andrew Garfield, Sam Worthington, Vince Vaughn and Hugo Weaving. Of all these movies like Dunkirk, my top choice for a realistic look at WWII is definitely Saving Private Ryan! It’s a hard movie to watch, but so worth it. Do you have any other favorite war movies like Dunkirk? Share below!